The Bellings Media Chef digitally displays recipe videos while you cook. Now, I'm not saying you could do this with your laptop and save money, but I am totally telling you could do this with your laptop and save money. Or better yet, do what I do: Forget this thing and take out one of those archaic dead tree cookbooks, turn a few pages, and read the mysterious "ink" that resides on them. No? Still craving the frame? OK, then some details... 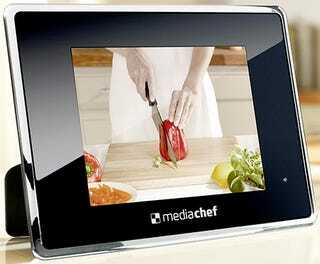 The $271 8-inch digital frame plays 48 instructional videos featuring chef Brian Turner. The action can be controlled by the included remote control, which we hope is waterproof or otherwise protected from flying food in some way.